Ayudha Pooja is to be celebrate on Navaratri ninth day. This function is also known as ‘Astra Pooja’. It is beleived that whatever work or profession we do is ‘LORD’ himself so in order to give respects to all the things, materials or equipments that we use in our daily professional life this poojai is done to them. 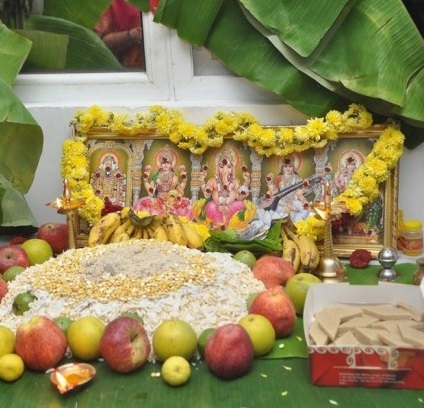 This function is performed by decorating all the professional materials with Sandals, Kunkumam and with pooja things and then celebrating Ganapathy and a Lakshmi pooja for all the professional materials to have a long lasting life and is used effectively. This function is to be perform on Navaratri ninth day. It can be performed in home, shops and offices.